Buying gold bullion remains an appealing option for many investors who are growing increasingly wary of the volatile stock market and other economic instabilities. If you are looking to protect your own savings and lifestyle, then it may be time to consider investing in precious metals. Whether you’re focusing specifically on retirement plans, diversifying your portfolio, or making your first serious investment in gold, there are several options that could help you achieve your individual goals. Before you invest, take the time to think about what you hope to gain by buying gold bullion. How does it fit your current investment strategy? How long do you plan to hold the assets? Answering these questions will help you and your precious metals advisor create a focused strategy that is customized to your needs. Let’s take a look at some of the key considerations to make when investing in gold, which may play a role in your overall strategy. One of the main reasons why investors consider buying gold bullion is for diversification. Any financial advisor will tell you that diversification is a fundamental strategy to investing. Whether you plan to move a significant percentage of your portfolio to investments in precious metals, or just a portion of it, diversifying your assets can help safeguard against the risks of investing your entire savings in paper assets like stocks and mutual funds. Precious metals have consistently been seen as a safe haven, and over time have been a key ingredient to a balanced investment portfolio. Stock market volatility is one of the biggest threats to investors who rely primarily on paper assets, especially for those who are planning for retirement. When the stock market drops, it can rapidly derail an investor’s financial goals. And since the stock market can be influenced by so many different factors, it’s no wonder that investors choose to protect their savings with more stable investments. Buying gold bullion (More Info) can also be used as a strategy for preserving your wealth, lifestyle and purchasing power. Over the past decade, the dollar has continued to decline in value. This alone can have a very detrimental effect on Americans’ future spending power and overall wealth. Gold bullion, however, is an extremely liquid asset that tends to increase in value as the dollar declines. This is why many investors use it as a strategy to hedge against inflation and thus shield their wealth from economic instabilities. It’s important to also consider the growth potential of gold. Today’s gold prices are seen as a bargain by many analysts, even after hitting historic highs over the last decade. This is yet another reason why investors use gold as a fundamental piece of their investment portfolio. Our knowledgeable precious metals advisors are happy to speak with you about your unique investment goals. 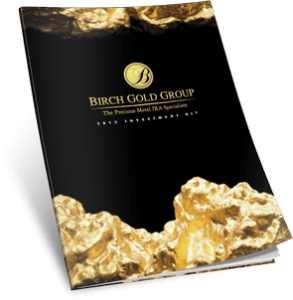 Rated A+ by the Better Business Bureau, Birch Gold Group is dedicated to helping our clients protect their portfolios with gold, silver and other precious metals. From gold bullion coins to gold-backed IRAs, we offer a wide variety of options and can help you determine what may be best for your situation. Simply fill out the form on this page to request more information about investing in gold, or call us today at (800)355-2116.